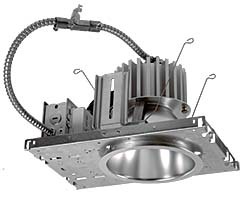 OSRAM RLD6 six-inch LED architectural downlight features glare-free optics and a 46-degree cutoff angle. Available in 2700K, 3000K, 3500K, and 4000K CCT with a CRI of 80. Offered in 18 to 30 watts depending on lumen package, the luminaire is dimmable down to 1 percent and comes standard with built-in 0-10VDC protocol.